The Cow was first spotted on June 16 after the ATLAS telescope captured an extremely bright anomaly 200 million light-years away in the Hercules constellation. An worldwide team of astronomers, using NASA telescopes, have captured the first ever image of a star that collapsed to form a compact object, and are debating whether it is a black hole or a neutron star. 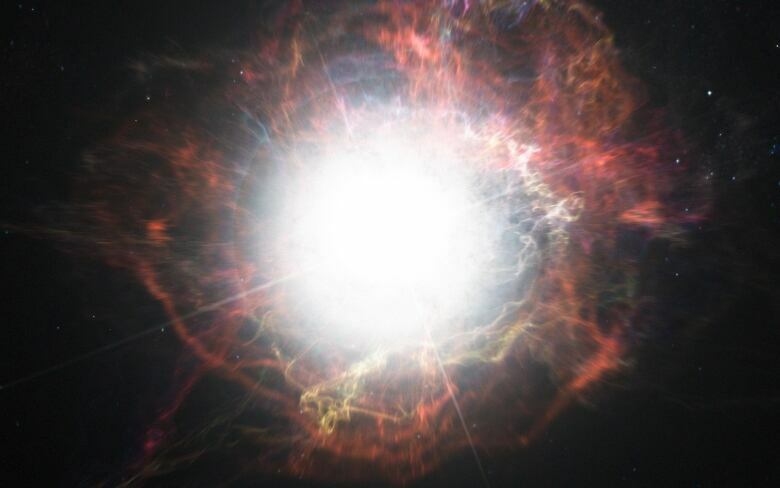 "We know that black holes and neutron stars form when stars collapse and explode as a supernova, but never before have we seen one right at the time of birth", adds co-author Indrek Vurm of Tartu Observatory, Estonia, who worked on modelling the incredible event. The bright glow was caused by the debris swirling around its event horizon, astonishing the researchers. Lead paper author Raffaella Margutti says that based on X-ray and UV emissions, The Cow may have been caused by a black hole as it swallowed up a white dwarf star. "We know from theory that black holes and neutron stars form when a star dies, but we've never seen them right after they are born". The team used observational facilities at the W.M. Keck Observatory in Hawaii and the MMT Observatory in Arizona, as well as remote access to the SoAR telescope in Chile to look at the object's makeup. They found that it was composed of hydrogen and helium. Another team of scientists, analysing data from multiple observatories, including NASA's NuSTAR, ESA's (the European Space Agency's) XMM-Newton and INTEGRAL satellites, and the National Science Foundation's Very Large Array, claimed that it is a supernova - a stellar explosion - could be the source of the Cow. Just two days after hordes of astronomers the world over pointed their space- and ground-based telescopes at the mysterious celestial "cow", they realized this was a far from ordinary supernova: in a matter of days it had outshone anything previously observed in the history of astronomy, between 10 and 100 times brighter than any supernova observed by human instrumentation. "That was enough to get everybody excited because it was so unusual and, by astronomical standards, it was very close by".